“Solar alliance has fulfilled my long cherished dream”, announced Prime Minister Narendra Modi at a special event for the launch of solar alliance held at COP21 in Paris. 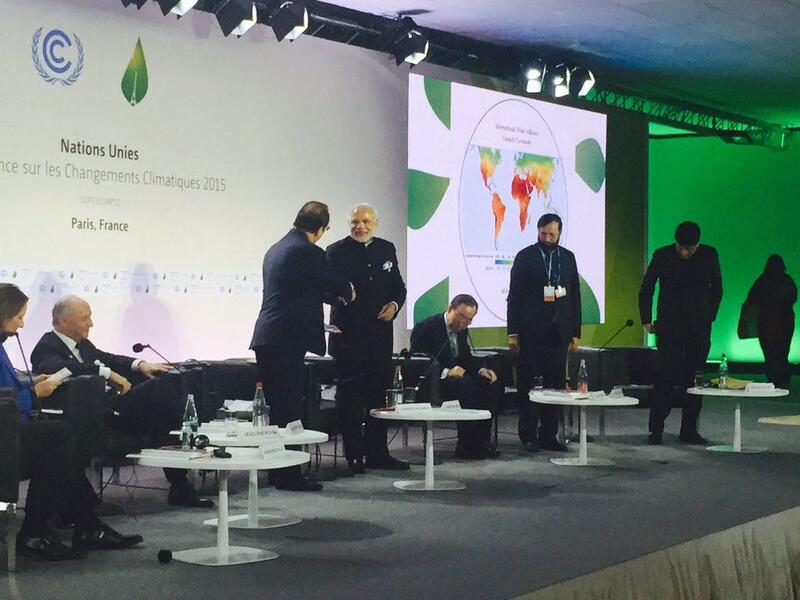 The French President Francois Hollande and the Indian Prime Minister jointly launched the International Solar Alliance (ISA) on Monday, the first day of the COP21. Hollande stressed on the great potential of solar energy and how some countries only have sunshine to rely upon as a source of energy in the future. “France would help the countries in the solar alliance mobilise finance, technology transfer and knowledge sharing, with particular focus to the African countries,” said Hollande at the launch. The two heads of state were joined by United Nations Secretary-General Ban Ki-moon, current COP21 President Laurent Fabius, India’s Minister of State with Independent Charge for Power, Coal, New and Renewable Energy Piyush Goyal, and Union Minister of State of Environment, Forest and Climate Change Prakash Javedekar, along with 71 heads of state who had agreed to be part of the inauguration. The invites were sent out to 121 countries, including China and United States, who were not a part of the launch. All the emphasis for the development was laid on the fact that solar energy is capable of providing access to millions of people in the world who currently have none. The alliance also aimed at bringing together developed and developing countries, governments, private sector, research laboratories and institutions, in a common enterprise. The declaration also talks about mobilising more than US $1000 billion by 2030, that are needed for innovative policies, projects, programmes, capacity building measures and financial instruments to augment solar power generation in all member countries. However, it wasn’t clear whether this amount would be contributed or raised by public funds, corporate contributions and investment, multilateral banks or funds like Green Climate Fund (GCF) or a combination of all. The first steering committee meeting would be held on Tuesday, December 1, 2015 in the COP21 premises and the official announcement of member countries would be held in April 2016.